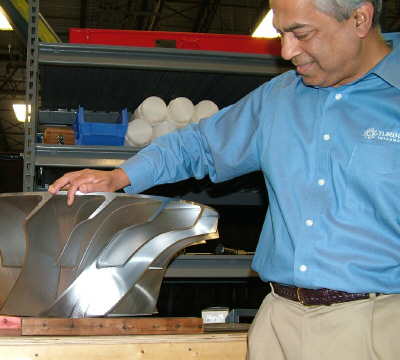 Marian Noronha, founder and CEO of Turbocam, Inc. This edition of the Featured Machinist series is a little different. While my previous articles have focused on individuals with outstanding skills using the lathe, mill and other metalworking tools, this one is about a man who built a business that does high-precision, high-volume production machining making various types of turbines. Marian Noronha is a unique and complex individual. I met him many years ago, around 1980, when I was living in a small town in Vermont. At that time, I was a leader of a bible study group, and Marian came to one of our meetings, looking for answers about the deeper truths in life. Marian is one of those people who, almost literally, thirsts for knowledge. He wants to understand how things work, and he studies, thinks and develops his ideas and convictions until he has satisfied the thirst. From those roots, he became a committed Christian, and that has been the central theme of his life ever since. He has a wonderful family with his wife Suzie and their five sons. Back in those days, Marian was an engineer working for a small Vermont company that was making windmills for home electrical power generation. Around that time, Federal subsidies for alternative energy had created a mini-boom in windmill development. I don't know much about the details of the work he was doing back then, except that he was involved in the theory and design of the propeller blades from which the windmills grab power from the air. He lived frugally back then, and still does now, but not quite to same degree. Marian immigrated to the US from India and had little in the way of resources, other than his drive and intelligence, to live on. He had saved some money; enough to buy a small plot of land for a homestead. The price per acre was quite low, even though a small, clear stream flowed through the property. It seems that the property had no direct access by car or truck to a public road - except, with permission, by crossing the seller's land. Fortunately, the seller's property bordered on a paved public road, and Marian could park his car there on a small pulloff. A path through the woods led down a steep slope to a flat area, where Marian had established a campsite and was building a cabin. A zip-line, essentially a braided steel cable with a small "cable-car", transported heavier goods from his car downhill to the campsite. Every two weeks, when he got his paycheck, Marian stopped by the local building supplier, loaded up the trunk of his car with cinder blocks and bags of concrete, lashed some 2x6's and plywood panels to the roof and headed for the campsite. 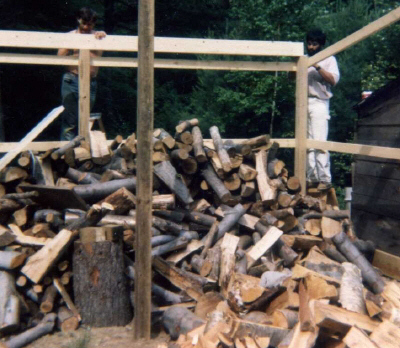 Using the zip-line he transported to building materials down to the work site and, at the end of each summer workday when the days were long, and on weekends when the days got shorter, Marian constructed the shell of a small cabin. By small, I mean about 20x20 ft, and even that may be an overestimate. Hung from the ceiling by cables, the sleeping platform, during the day, was hoisted up to make extra floor space. A woodstove provided heat during the below-zero winters when a foot of snow was a considered an average storm. A big storm might drop three feet over 24 hours. Heat was not a problem since a woodstove in a space that small keeps things pretty cozy, at least until the logs burn down around 4 am and the indoor temp drops to around 47. But a decent sleeping bag will keep you warm even at that temperature. With a potable stream a short walk from the house, water for drinking, cooking and cleaning was plentiful. Showers could be taken at the college gym, 10 miles down the road. (In those days, almost anyone could walk onto campus and use the facilities without causing any concern; the college considered the local community to be part of its population.) Near the college, laundromats were common, so laundry facilities were not needed in the cabin. There was no electricity. Well, strictly speaking, that's not quite accurate: there's was electricity, just not very much. Marian kept an extra car battery in the trunk of his car, connected to the main battery, and thus the alternator, by heavy-duty cables. (he's a trained engineer, so he knows how to do this stuff safely!) As a rural community, trips in Vermont tend to be longer than in the suburbs, so the battery could get a pretty good charge just by driving to work and back. When he came home to the cabin each evening, the extra battery would ride down the zip-line to the cabin, where it provided power for the "electric lighting", dim though it was. Next morning, the battery was hauled up the zip-line, back into the trunk of the car for recharging. I imagine that this could get extra-entertaining when the zip-line was coated with freezing rain. Before long, Marian fell in love with Suzie, a wonderful young woman in our bible study, and they soon were married. Their first of five children came a year later and their family life grew and matured. Gradually, Suzie domesticated her young husband, encouraging him to move to a real house with modern electrical appliances. Good women are like that. Eventually, the Federal subsidies for alternative energy expired, the windmill company downsized, and Marian was looking for "alternative employment"; a new job, that is. Fate, necessity and the calling of a new church led Marian and Suzie to the Boston area where Marian found work in a shoe factory. Now, shoe-making may seem like an unlikely transition from designing high-tech windmill components, but, at that time, shoe factories were on the forefront of adopting CNC machining technology. 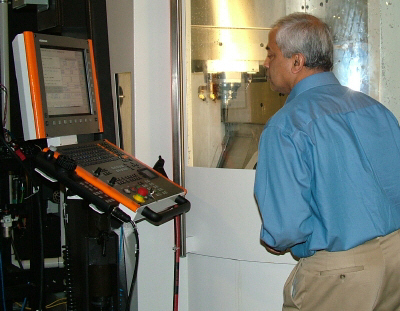 For a manufacturing engineer, an opportunity to learn CNC programming was too good to pass up. Shoes are fabricated on a shoe-shaped form called a "last". Each size and style of shoe requires a different last, and they don't last forever (I know, I know, poor punishment) so you have to keep making lots of them. In the old days, I guess they employed legions of master carvers to hew from wood the many lasts that were needed by the factory. But as competition from lower cost foreign labor became a key factor in the survival of US-based shoe manufacturers, automation took hold. CNC milling offered, briefly at least, a respite from foreign competition. Once programmed for a particular style of shoe, a CNC mill could turn out as many lasts as needed, working day and night, 24x7, with every copy precisely like the others. Scaling up or down for other sizes, or changing shapes for a new shoe style, was a straightforward programming exercise. 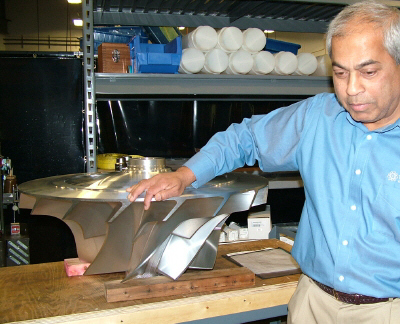 Ideas always spinning in his subconscious, Marian recognized the potential for applying his newly developed CNC programming skills to problems he had tackled in designing the aerodynamic shapes of windmill blades. New concepts were imagined. Keeping up with trade journals in aerodynamics, Marian was aware of work being done in the field of turbocharged engines for over-the-road trucks. The fuel shortage of the early 1970s, whatever its true causes, had created a crisis for the trucking industry and technologies that could save fuel were in high-demand. 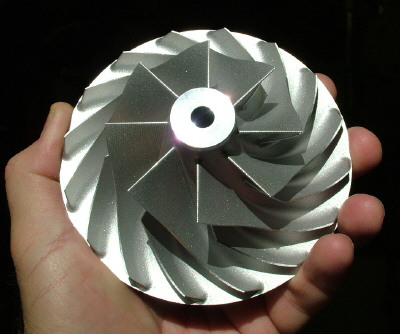 Turbochargers were already well-known and widely used by then, but their full potential was limited by the strength of the compressor rotor, which typically was cast. Marian understood that higher rotational speeds, and thus greater fuel economy, could be attained if the rotor could be manufactured directly from a solid billet of high-strength alloy, but CNC milling of such a complex shape was considered to be beyond the capabilities of CNC technology. And, even if the algorithms to shape the compressor blades, which overlap like the petals of a rose, could be solved, machining impellers one at a time did not seem viable as a production solution. But the idea had taken hold in Marian's mind, and he could not let go of it. Maybe it was just the intellectual challenge of solving the machining algorithms, or maybe it was a vision of what a whole factory-floor of CNC machines could do in concert, that drove Marian forward in his effort to machine a functional compressor impeller from a solid billet of high-strength alloy. Inventors, if they are to succeed financially, must also be salesmen - bold salesmen - and Marian fits that mold. Establishing a foothold with a manufacturer of diesel truck engines, he pitched to them that he could produce a machined impeller that would pay for itself through improved fuel efficiency. The manufacturer was skeptical, but interested, and agreed to pay Marian to produce a prototype impeller: But payment would be made only when (and if) it was delivered as a finished product. Borrowing money from family and friends, Marian rented time on CNC machines that were idle at night, and worked steadily toward his goal, into the early hours of morning, week after week. 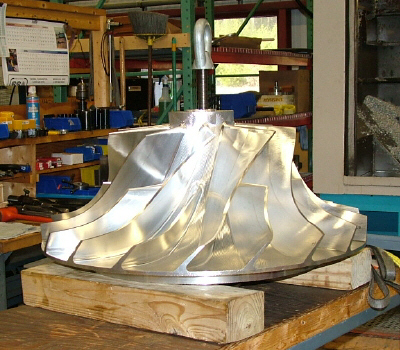 Inexorably, each challenge was overcome, and the impeller evolved in shape until it was ready for testing. The engine manufacturer was impressed. 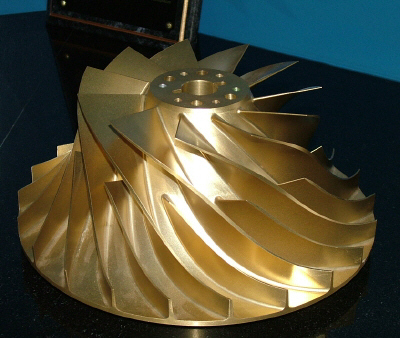 Marian had delivered on his commitment and turned over to them the first prototype impeller for actual testing in a turbocharger. It worked! A successful prototype, no matter how promising it may seem, is only a first step on a long arduous journey to manufacturing and selling a product in volume and actually making a profit. 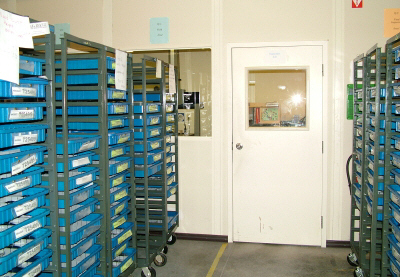 The calculations of profit margin, if there is one at all, can be quite complex, since they must include the cost of raw materials, labor, tooling, machine time, downtime, taxes, legal and accounting advice, licenses, insurance, transportation and the myriad of other costs and complexities that are all part of the reality of starting a new business. A man who goes down that path needs strong faith - and a very patient and loving wife - if he intends to stay married. Marian had them, and still has both. His journey has been a great success. I don't know too much about the intervening years, but suffice to say that many trials, tribulations, setbacks, and, of course, victories and advances, occurred along the way to building Turbocam into the successful international enterprise that it is today. Based in Barrington, NH, Turbocam occupies a modern, energy-efficient building, with space for future growth and expansion. 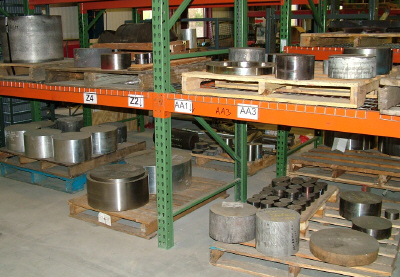 Over 200 full-time employees work here - except on Sunday - when the plant operates unattended in fully-automated production, cranking out finished impellers onto conveyor lines, ready for QC inspection on Monday. 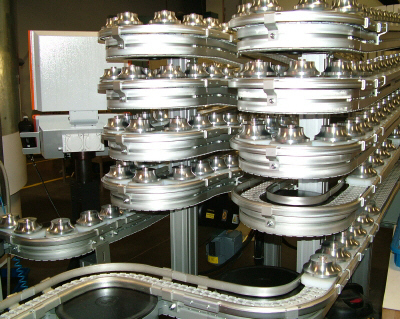 Automated operations are controlled by TAPS (TURBOCAM Automated Production Systems) software developed by Turbocam with CAMplete, a Canadian partner company. Worldwide, Turbocam has manufacturing operations in India, Romania, the United Kingdom and Taiwan, and sales offices in Canada, India, Japan, the Netherlands, Taiwan, South Africa and the United Kingdom. 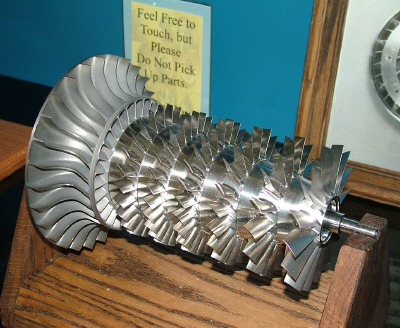 On display in the lobby are some impressive examples of the complex turbine impellers made by Turbocam. 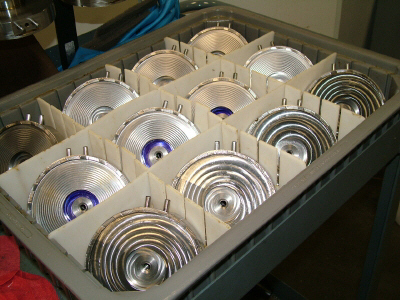 Some are production models while others are prototypes developed for various hi-tech customers. For someone like me, who likes machines and machining, the production floor at Turbocam is a real delight to see. There's so much to take in that I could have spent hours just asking questions. Marian was kind enough to give me and my wife a tour of the factory after hours, when operations had been scaled down for the weekend, so that we could walk around safely and look closely at many of the machines and products on the floor. Work is about evenly divided between high-volume production of turbocharger impellers and short-run production and prototypes of highly specialized turbines of many configurations and sizes up to about 30" in diameter. 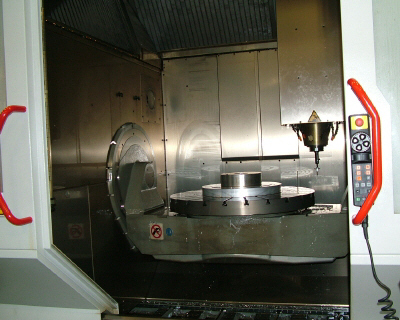 Throughout the factory, there are many CNC machining centers. The largest ones can handle materials up to about 36" in diameter by 24" high. 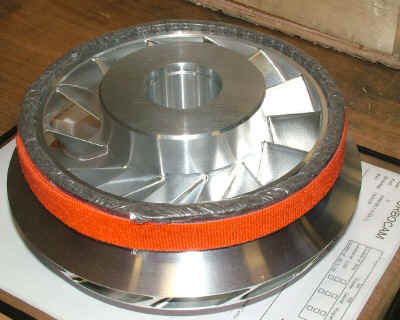 A jumbo-size impeller on 4x4s. Note ring for lifting by crane. A good part of the floor space is dedicated to the high-volume automated production of the diesel truck turbocharger impellers that are still central to Turbocam's business. They're about 4.5" dia x 2" high. 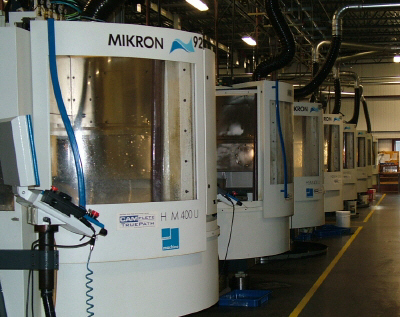 There are 20 or more 5-axis milling centers dedicated to this work. 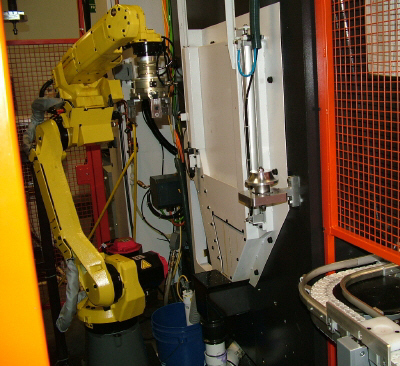 Each machine is fed by a conveyor system and a robotic arm that moves the raw material into place for machining, then moves the finished part back out to another conveyor line for inspection and shipping. 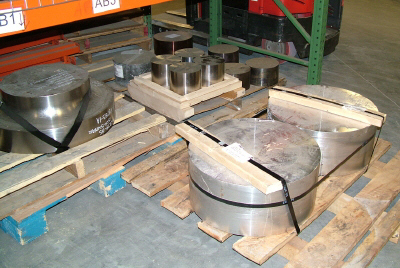 The impellers start out as pre-formed blanks that are already shaped by the metal supplier to the basic form of the impeller to reduce machining time, waste and tool wear. 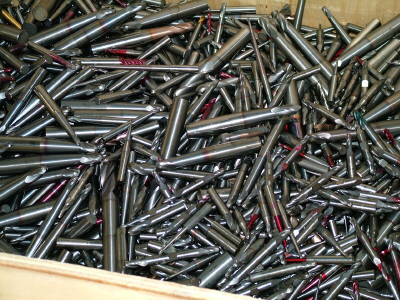 And there are lots of machining centers! 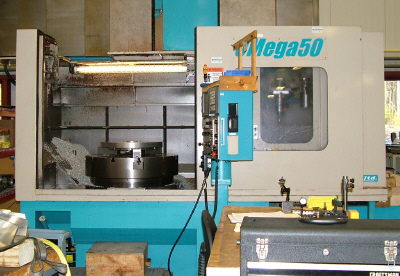 These machines consume a lot of carbide cutting tools! When I first saw the tool holder on the right in the photo below, I thought "Uh-oh, looks like that tool holder really got overheated!" I was right, but not for the reason I expected. It turns out that the tooling is held in the tool holder by an interference fit. 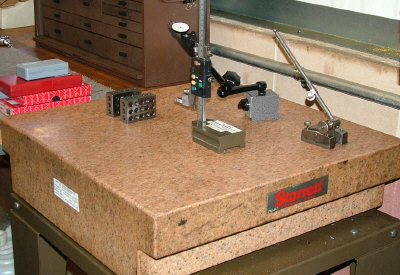 Ordinary tool holders, such as collets or end-mill adaptors are not precise enough for this high-precision work. 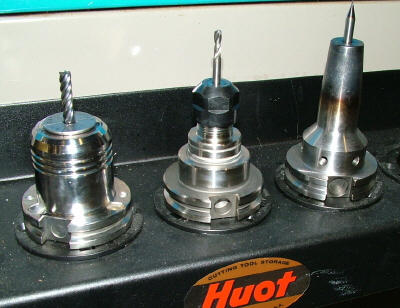 For ultimate centering of the tool, the center hole in the toolholder is a few ten-thousandths of an inch undersize. The holder is heated up, using an induction coil, causing the tool holder to expand uniformly and the hole to become just large enough for the tool shank to slide into place. Not surprisingly, this operation is performed by a special machine, not by hand. When the heating energy is cut off, the tool holder shrinks, holding the tool extremely tightly and centered as perfectly as possible. So in fact, many of the tool holders have that same overheated look - it's normal for this type of tool holder. 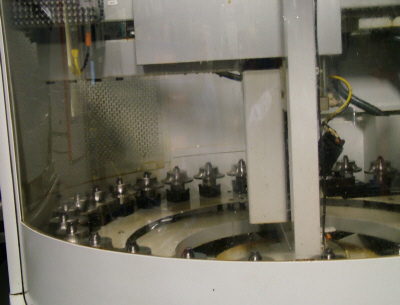 One interesting feature of Turbocam operations is that the cutting fluid is captured, filtered and recycled. 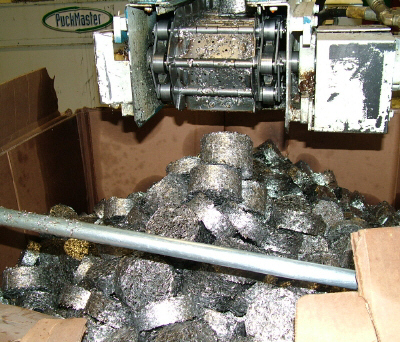 Metal chips are collected at each machine and fed to a powerful hydraulic press, called the Puckmaster, that compresses the metal swarf down into a hockey-puck-size (hence the name) chunk of metal that is then recycled. 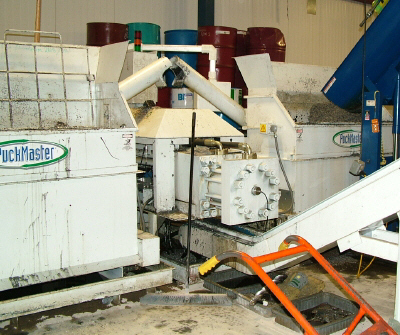 Another environmental benefit of the Puckmaster is that the cutting fluid is squeezed out of the puck, where it can separately be collected and recycled. 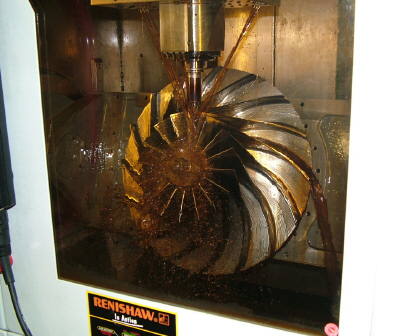 Another unique aspect of the Turbocam plant is the method used to recycle waste heat produced by the machining centers. As they come from the manufacturer, each machining center has an external heat exchanger, not unlike a small version of the heat pump that heats and cools many US homes in temperate climates. 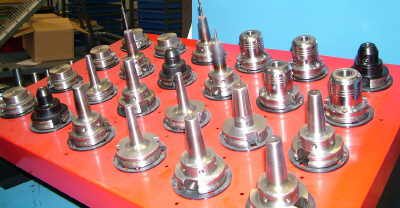 It's essential to remove the excess heat from the spindle; otherwise the high cutting speeds and continuous operation would quickly burn out the spindle bearings. In a standard factory configuration, the waste heat is expelled by the many heat exchangers to mix with the factory air. Even in winter (and the winters get really cold here in New Hampshire) it's necessary to run the big main plant heat exchangers to remove the excess heat from the factory. This amounts to running air conditioning in the winter. Now this just didn't seem right to Marian, so he decided to do something about it. He hired an ingenious local HVAC mechanic to modify the heat exchangers on the machining centers to feed their waste heat into a central piping system. From there the heat can be circulated and put to use - including heating the sidewalks and driveways around the plant for automated winter snow removal that would otherwise require the use of a snowplow and snowblowers. During the summer months, the excess heat is fed to an evaporative cooling tower that efficiently cools the plant. Having operations in India and other countries requires Marian to travel several times a year. An important aspect of his Christian beliefs is not just to have personal faith, but also to spread the word and to change people's lives. Some years ago he began a ministry of buying people out of slavery. Yes, that's right, there are people around the world who still are born into slavery and Marian, being a practical sort of Christian, decided that buying them out of slavery and giving them a small stipend on which to start a new life was the right thing to do in that situation. 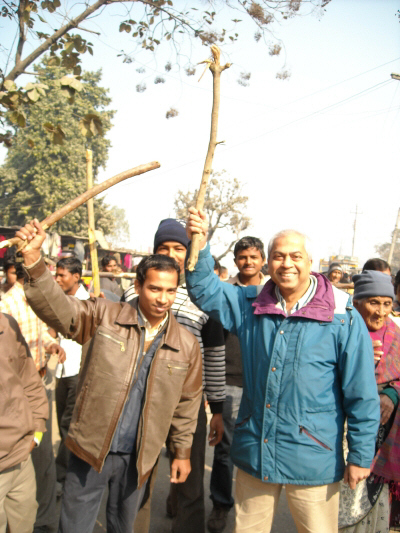 He also buys good-quality farm land and helps set up farming operations for developing churches in India. Of course, not everyone appreciates these faith-inspired projects, so it's not surprising that Marian is sometimes the target of criticism from individuals and organizations that are opposed to that sort of work, or to Marian's opinions about business and politics. Having an indomitable sense of humor, Marian decided to join in the fun. These guys were quite serious and weren't at all sure at first what to make of Marian. 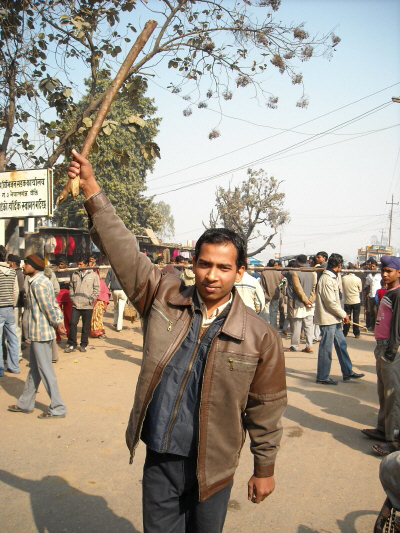 He decided that if they didn't bash him in the head with their cudgels, that was a sure sign of acceptance. Soon he was on his way, leaving his new-found friends to guard the border. Another project that Marian and his co-workers at Turbocam have been involved with is providing clean water for areas in the world where it is not readily accessible. Partnering with Water Missions International, which has developed a self-contained water purification systems that can supply clean drinking water for a small village,Turbocam and its employees donate funds to support this effort. 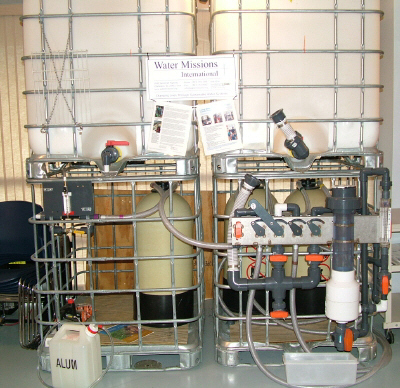 One of the water purification systems is on display in the Turbocam employee break room, along with a large jar where employees and visitors can choose to make donations in support of this and other projects that inspire hope and new life. 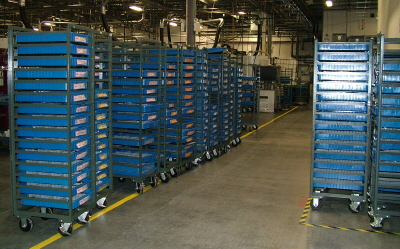 Another aspect of Turbocam culture inspired by Marian and shared by many employees, is a strong commitment to supporting America's men and women in uniform. When several Turbocam employees in the Reserves were called to active duty in Iraq, the Turbocam management team set up a fund to provide the deploying employees with laptops to communicate with their families by email. Another fund was set up from which the deployed troops can purchase items that are unavailable through the military supply chain. This is another example of how faith translates into action here at Turbocam. 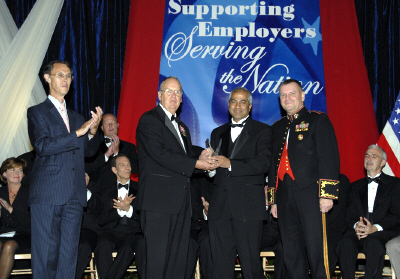 In recognition of this exceptional support of our armed forces, Turbocam has received several awards, including the 2007 Freedom Award, featuring a visit to the White House to be recognized by President Bush, together with other industry leaders who have provided outstanding support for the men and women who serve in our Armed Forces. I find that one of the interesting things about getting older is to observe the lives of friends I knew when I was much younger and see how their lives turned out (or my own life, for that matter.) We all start out with dreams and plans for the future, but life has a way of shaping us and changing our priorities. When we were married, my wife and I decided we would not have children. We have four; and six grandchildren. That was Plan B, I guess. Marian is a man who established his faith and beliefs when he was young, and made a commitment to be true to those beliefs wherever they led him. The journey has never been an easy one, but his faith, his family and his church have given him the strength to get through the tough times. And through that process, he and Suzie have raised five fine sons and helped hundreds of other people make their way through the challenges of life. Along the way, Marian and his Turbocam management team, some of whom share his Christian faith, built an amazing business that provides jobs for hundreds of employees and revenue for the community. Not bad for a life's work - and he's not done yet!